This book presents an interpretation of Kant’s Critique of Pure Reason as a priori psychologism. 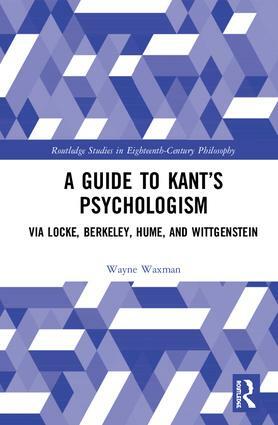 It groups Kant’s philosophy together with those of the British empiricists—Locke, Berkeley, and Hume—in a single line of psychologistic succession and offers a clear explanation of how Kant’s psychologism differs from psychology and idealism. The book reconciles Kant’s philosophy with subsequent developments in science and mathematics, including post-Fregean mathematical logic, non-Euclidean geometry, and both relativity and quantum theory. It also relates Kant’s psychologism to Wittgenstein’s later conception of language. Finally, the author reveals the ways in which Kant’s philosophy dovetails with contemporary scientific theorizing about the natural phenomenon of consciousness and its place in nature. This book will be of interest to Kant scholars and historians of philosophy working on the British empiricists. Wayne Waxman is the author of Kant’s Anatomy of the Intelligent Mind, Kant and the Empiricists, Hume’s Theory of Consciousness, and Kant’s Model of the Mind. He is retired and lives in New Zealand.